The Norman Rockwell Museum houses the world’s largest and most significant collection of Rockwell art. Norman Rockwell Museum presents, preserves and studies the art of illustration and is a world resource for reflection, involvement and discovery inspired by Norman Rockwell and the power of visual images to shape and reflect society. The Museum advances social good through the civic values of learning, respect and inclusion and is committed to upholding the rights and dignity of all people through the universal messages of humanity and kindness portrayed by Norman Rockwell. 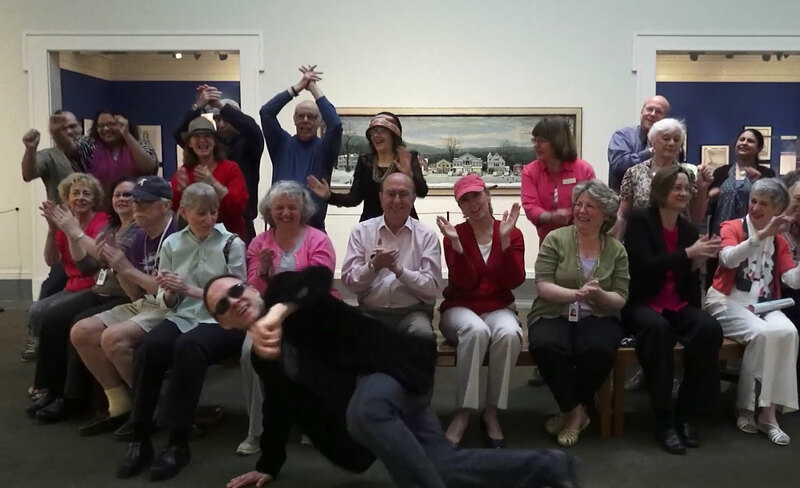 Founded in 1969 with the help of Norman and Molly Rockwell, Norman Rockwell Museum is dedicated to the enjoyment and study of Rockwell’s work and his contributions to society, popular culture, and social commentary. 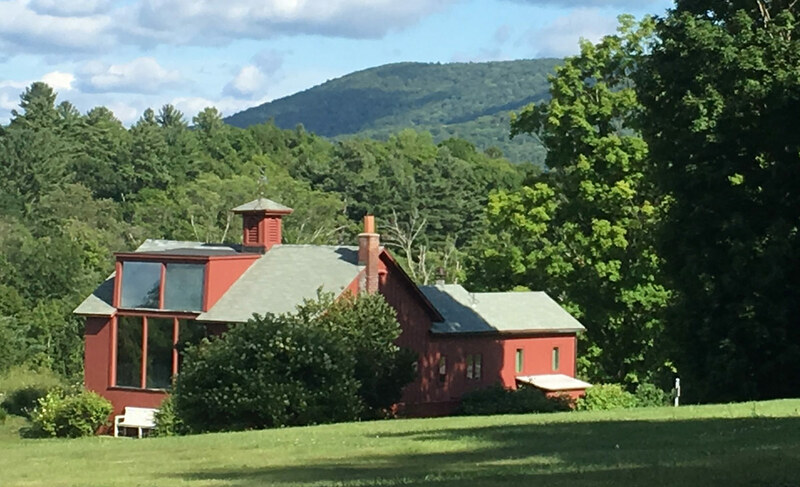 The Museum, which is accredited by the American Association of Museums, is the most popular year-round cultural attraction in the Berkshires. 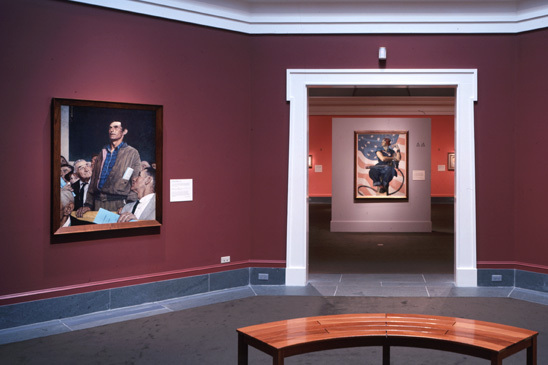 The Museum houses the world’s largest and most significant collection of Rockwell’s work, including 998 original paintings and drawings. Rockwell lived in Stockbridge for the last 25 years of his life. Rockwell’s Stockbridge studio, moved to the Museum site, is open to the public from May through October, and features original art materials, his library, furnishings, and personal items. 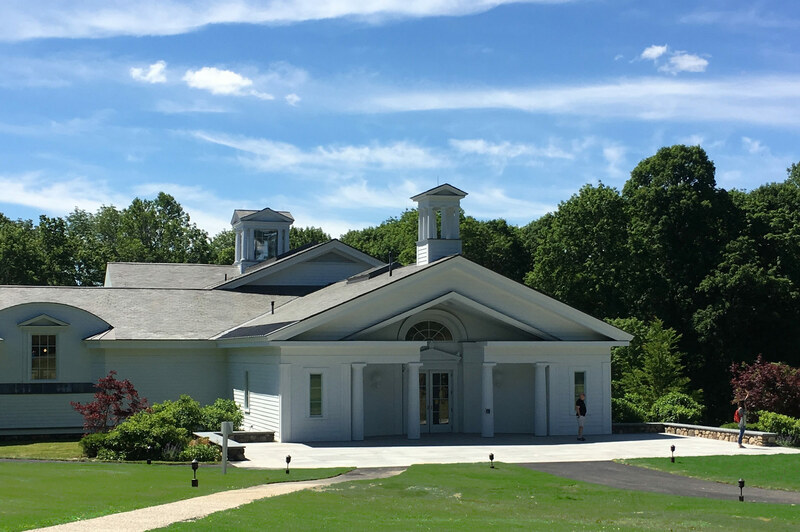 The Museum also houses the Norman Rockwell Archives, a collection of more than 100,000 items, including working photographs, letters, personal calendars, fan mail, and business documents. 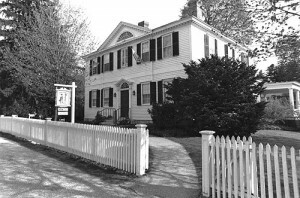 Having spent its first 24 years at the Old Corner House on Stockbridge’s Main Street, the Museum moved to its present location, a 36-acre site overlooking the Housatonic River Valley, in 1993. Internationally renowned architect Robert A. M. Stern designed the Museum gallery building. Rockwell occupied some 20 studios during his life, but it was the last one—seen below—that he called his “best studio yet.” The building was originally located in the backyard of his home on South Street in Stockbridge, Mass. 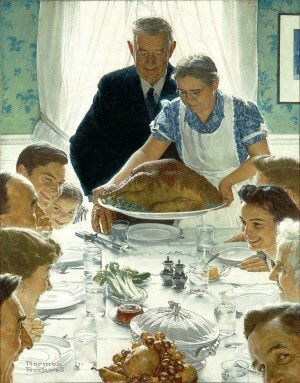 In 1976, toward the end of his life, Rockwell left the studio and its contents to Norman Rockwell Museum. The building was cut in two and moved to the Museum’s grounds in 1986. The Museum has long presented the studio as it was when Rockwell passed away. Now, we have turned back the clock to an earlier, active period in his career: October 1960, when he was hard at work on his painting, Golden Rule, which would later appear on the cover of the Saturday Evening Post. Enjoy this special glimpse into Rockwell’s surroundings, working process, and sources of artistic inspiration…just as they were in 1960! For nearly 50 years, millions of Americans brought Norman Rockwell’s art into their homes, enjoying the artist’s Saturday Evening Post covers while seated in their favorite chairs, surrounded by their belongings in the company of their families. 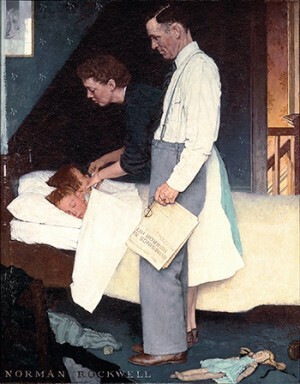 This intimate connection with Rockwell’s art made his images a part of the fabric of American lives. 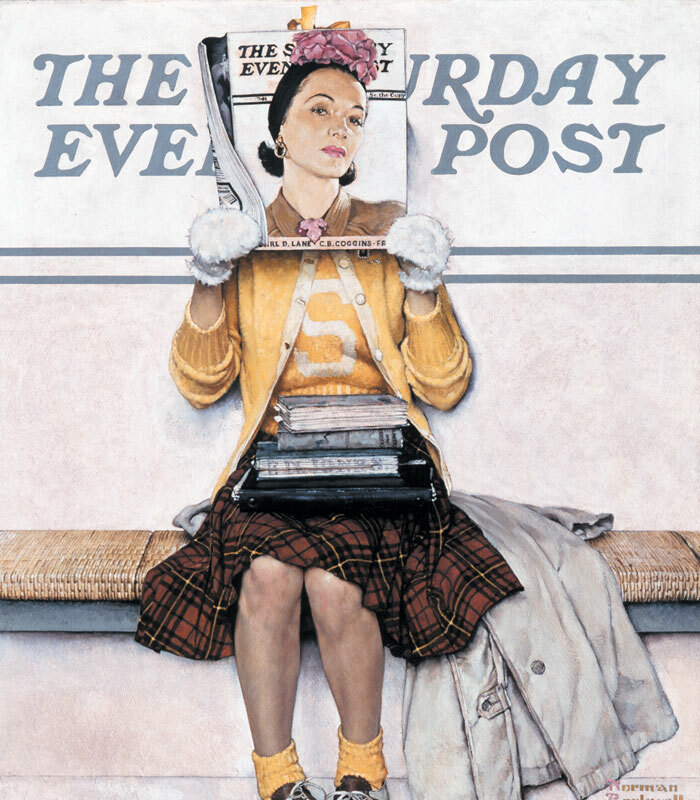 This comprehensive exhibition of original Saturday Evening Post cover tear sheets features each of Norman Rockwell’s illustrations for the publication, created between 1916 and 1963. Stockbridge Mainstreet at Christmas (Home for Christmas), Norman Rockwell. 1967. In his January 1941 address to Congress, President Franklin Delano Roosevelt articulated his vision for a postwar world founded on four basic human freedoms: freedom of speech, freedom of religion, freedom from want, and freedom from fear. In the spring of 1942, Norman Rockwell was working on a piece commissioned by the Ordnance Department of the U.S. Army, a painting of a machine gunner in need of ammunition. Posters of the gunner, titled Let’s Give Him Enough and On Time, were distributed to ordnance plants throughout the country to encourage production. 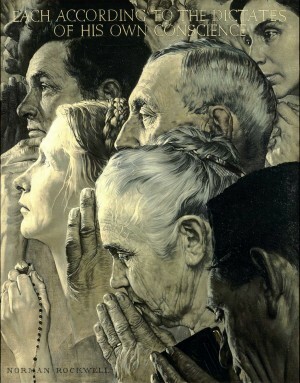 But Rockwell wanted to do more for the war effort and decided he would illustrate Roosevelt’s four freedoms. While mulling it over, Rockwell, by chance, attended a town meeting where one man rose among his neighbors and voiced an unpopular view. 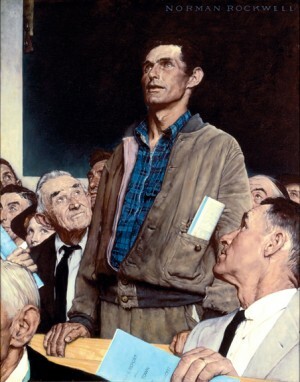 That night Rockwell awoke with the realization that he could paint the freedoms best from the perspective of his own hometown experiences using everyday, simple scenes such as his own town meeting. The paintings were a phenomenal success. After their publication, the Post received 25,000 requests for reprints. In May 1943, representatives from the Post and the U.S. Department of the Treasury announced a joint campaign to sell war bonds and stamps. They would send the Four Freedomspaintings along with 1,000 original cartoons and paintings by other illustrators and original manuscripts from The Saturday Evening Post on a national tour. Traveling to sixteen cities, the exhibition was visited by more than a million people who purchased 133 million dollars in war bonds and stamps. Bonds were sold in denominations of $25, $100, and $1,000, and each person who purchased one received a set of prints of the four paintings. The Norman Rockwell Archive contains more than 100,000 photographs, letters, and other rare mementos. A visit to the Museum is an uplifting experience. 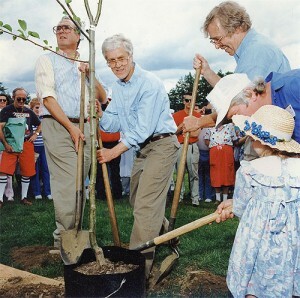 Founded in 1969 with the help of Norman and Molly Rockwell, the Museum is dedicated to the enjoyment and study of the work of America’s favorite artist. The Museum’s changing Norman Rockwell exhibitions present an illustrated chronicle of American life and showcase our nation’s ideals of kindness, tolerance, democracy, and freedom, as interpreted through the artist’s spirit, wisdom, and gentle humor. A visit to the Museum is an uplifting experience. Founded in 1969 with the help of Norman and Molly Rockwell, the Museum is dedicated to the enjoyment and study of the work of America’s favorite artist. 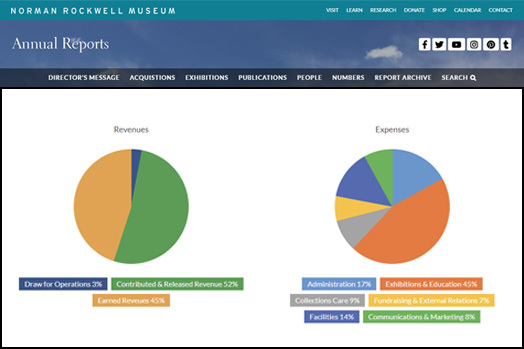 This Annual Report summarizes the strides that Norman Rockwell Museum has taken in the Fiscal Year 2018. 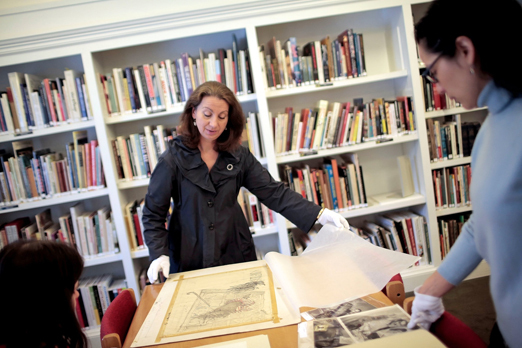 Read a message from the Director, FY 2018 aquisitions, exhibitions, publications, people, measures of success, and the Annual Report archive.